When Ken Tuck walked out to his Creek Ridge Lane mailbox last month, he didn’t know it, but he was walking right into some costly legal trouble. He pulled an envelope from the box and the first thing he noticed was a law firm’s name in the top left corner: McCreary, Veselka, Bragg & Allen, P.C. The letter made it clear what this was about. "NOTICE OF INTENT TO FILE FORECLOSURE LAWSUIT" was written across the top. 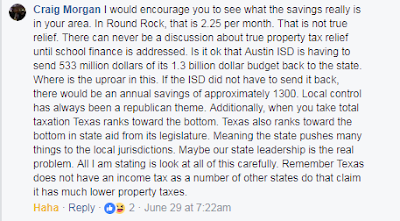 Williamson County, Round Rock, Round Rock Independent School District all wanted tax dollars Tuck owed them. The total 2016 tax bill was $2,312.58. He also didn’t know his mayor was the man behind the tax collection efforts, which led to the letter he was holding. That is, until we told him about it. In 2013, the Round Rock City Council gave MVBA the right to do whatever it takes—legally—to collect millions of dollars from Round Rock businesses and city taxpayers. Since then, the law firm has collected nearly $622,000 in past due library fines, court fines and property taxes, according to city and Williamson County records. The MVBA website shows, Round Rock Mayor Craig Morgan heads one of the most lucrative arms of the law firm—the one responsible for Williamson County and Round Rock tax collections. The city told KXAN it did not put any of the three contracts out for competitive bidding, citing a state law that allows professional service contracts to be handed out without a bid process. That means a competing law firm would have had no way to know the contracts the city gave MVBA were up for grabs. The city provided invoicing to KXAN showing $520,947.68 paid to MVBA between 2013 and August 2017 for municipal court and library collections. Williamson County tax office records show another $101,031.37 paid to MVBA on property tax collections. Round Rock has a total of $2.2 million in delinquent taxes as of this report. If MVBA collected all outstanding Round Rock delinquent taxes, the firm would pocket $335,485. MVBA could earn $1.8 million if it collected all outstanding WIlliamson County taxes today. This could be a local story of political corruption in Williamson County, except for one recent tidbit. In late June, well-respected local activist Jeremy Story announced his campaign for HD-52. HD-52 includes Round Rock. At the time, Story was launching a primary challenge to Larry Gonzales, though Gonzales' subsequent retirement has re-classified this as an open seat race. 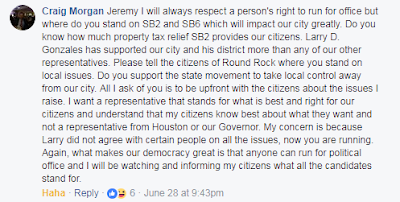 And how, pray tell, did Round Rock Mayor Craig Morgan react to Jeremy's announcement?!? 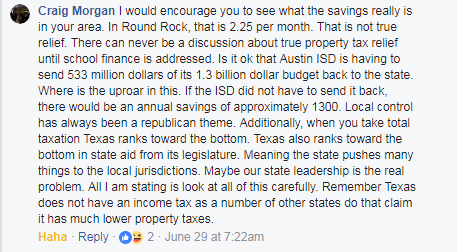 In other words, it turns out that a local official who "doth protested too much" during the legislative debate over property taxes earlier this year was personally drawing income from property tax foreclosures. Bottom Line: We don't have time to lead it, but he deserves a recall campaign.